Another nice surprise! This time from Cuba! 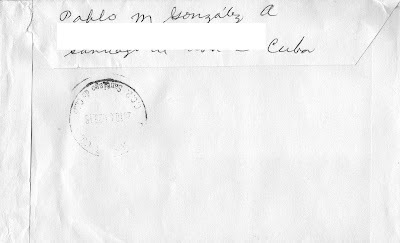 In fact it is only my second cover from this Caribbean nation! A great thanks, Pablo!! 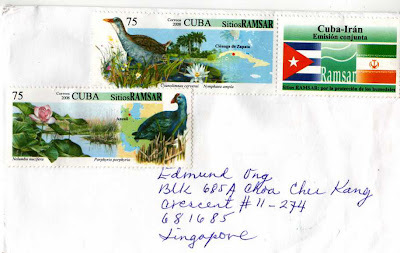 The stamps used on this cover belong to the 2008 "Cuba-Iran Joint Issue". The stamps feature a Ramsar site in each country, with the Ramsar Convention logo and the two countries’ national flags as the centre-piece. Featured are the Cienaga de Zapata Ramsar site in Cuba and the Anzali wetlands Ramsar site in Iran. 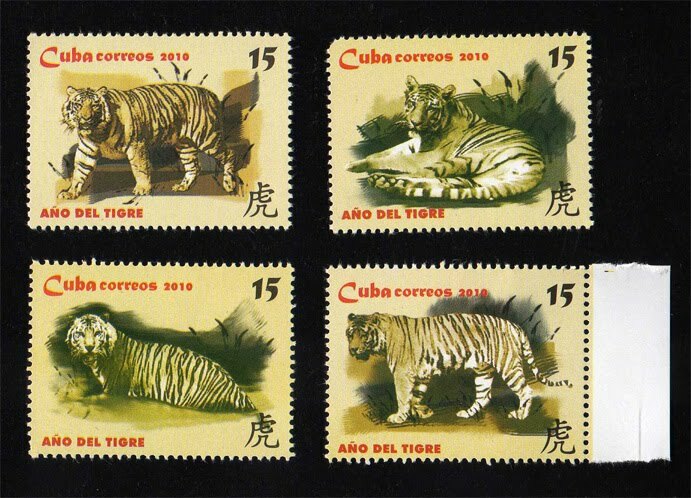 The Iranian version of the stamp has the same images but with different wording. In addition, Pablo enclosed a set of tiger stamps, issued in 2010 to commemorate the Year of the Tiger! Although, Thailand is only 157km away from Singapore, it is rarely do I receive a cover from our ASEAN friend. Hence, I was extremely happy to receive one last week! Terdsak Tublom used stamps from the "Bicentenary of the Demise of King Rama I of the Royal House of Chakri" series, issued on 06th April 2010. Thank you very much! Rama I (20 March 1736 – 7 September 1809) was the founder and the first monarch of the reigning House of Chakri of Siam (now Thailand). He ascended the throne in 1782, after defeating a rebellion which had deposed King Taksin of Thonburi. 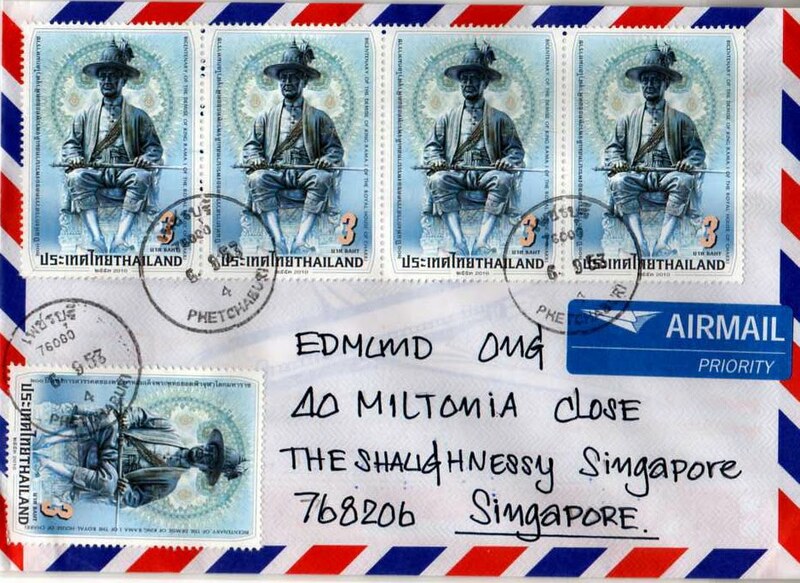 He was also celebrated as the founder of Rattanakosin (now Bangkok) as the new capital of the reunited kingdom. Rama I was born in the Kingdom of Ayutthaya, and had served King Taksin in wars against the Burmese Konbaung dynasty and helped him in the reunification of Siam. During this time he emerged as Siam's most powerful military leader. In 1782, he took control of Siam and crowned himself as the monarch. 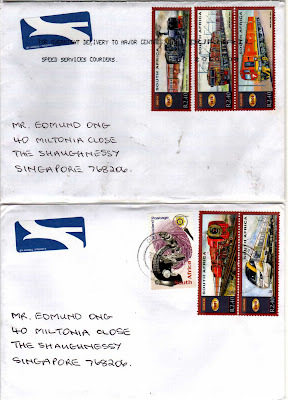 The next 2 South African covers sent by D.Hazell show Train stamps from the "150th Anniversary of Railway" series (a continuation of his previous cover). Thank you so much!